I focus completely on Audacity in this episode! This time, I share a brief explanation of copyright laws for podcasters, where to get music and sound effects, and three ways to work with background music or sound effects in your podcast. Hire me to design stuff for you! Make your message look great by hiring me to personally design your website, presentation, podcast cover art, and more! Visit D.Joseph Design to view my portfolio and request an estimate. I am neither a lawyer nor play one on TV. The safest thing to do is never use copyrighted music. However, you are allowed certain rights under fair use exceptions: 30-second previews if accompanied by a comment, or parodies of the song. Unless you have explicit permission from the copyright-holder to use copyrighted music or sound effects, don’t do it. 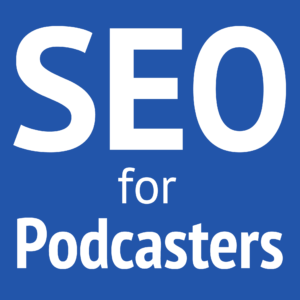 Look for royalty-free or podsafe music. Audacity presents three options for inserting audio into an open project: drag the audio file into your project window, or Audio menu > Import > Audio …, or use the keyboard shortcut Cmd-Shift-I (OS X) or Ctrl-Shift-I (Windows). Position your audio where you want it by dragging with the Time Shift Tool (F5) and clip it as necessary. If you want to adjust the audio’s volume without changing the audio itself (which would be a “destructive edit”), drag or double-click the Gain slider in the Track Control Panel. But this will adjust the volume of everything in the entire track, which may not be your desire. 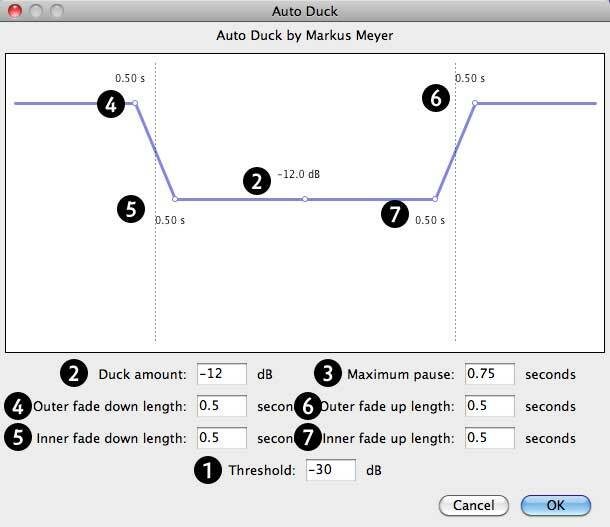 Audacity contains a handy tool, Auto Duck, for automatically reducing your background audio when you have speaking in another track. This is called “ducking” (because the background audio ducks whenever the there's audio in another track). Before you try Auto Duck, make sure that your background audio is immediate above your vocal track. When you're ready, select the portion of the music that you want to edit (or the whole track, after you're sure you have the right settings), then go to the Effects menu > Auto Duck. Threshold (default -30 dB) sets when Auto-Duck engages. When the audio in the vocal track (the track directly below your background music) is above the threshold, Audacity will duck the background audio (the audio you selected when you ran Auto-Duck). Duck amount (default -12 dB) sets how much Audacity will reduce the background audio. Maximum pause (default 1 second) sets how long Audacity will wait before returning the background audio to normal volume. This is the setting responsible for the up-and-down you may hear in background audio while someone is speaking. If you pause for 1 second or longer, Audacity will raise the background audio's volume. This is an important setting to avoid weird ups and downs. (4–7) Fade length sets how quick the fade down and fade up will be. A small value means a fast fade (default 0.5 second outer fades). 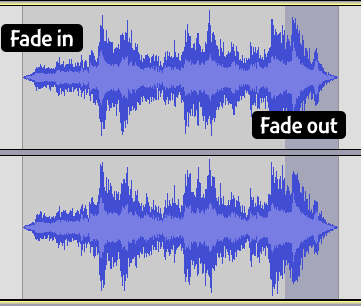 Outer is how quickly the background audio fades before and after your vocals, with no overlap. Inner is how quickly the background audio fades during the vocals, at the beginning and end. As great as this feature is, it makes destructive edits, which you cannot re-adjust later. The Envelope Tool allows you to finely control the volume for each track at any given time, and it does so nondestructively, so you can re-adjust it later on. Select the Envelope Tool (F2) and you'll see some new lines and shading added to your tracks. Click anywhere on a track to add control points. These are the points where the volume will either start or stop doing something. You need two for ever change: one to start and one to stop. The volume will change between the control points. Drag one of the inner control points (between the two shades of gray) to amplify the audio (note the dotted blue line on the outside). Drag one of the outer control points (on the thick blue line) to quiet the audio. Adding control points allows you to easily fade your music exactly how you want it, without permanently changing your audio. Image it as a little guy who turns the volume up and down every time you tell him. Neither the Envelope Tool nor Auto Dock are good for making fade ins or outs. The best way to do that is to clip your audio to the length it needs to be, select some of the beginning for a fade in, or select some of the ending for a fade out, and then select the appropriate command from the Effects menu. Stitch is a great program for listening to podcast through your smartphone. 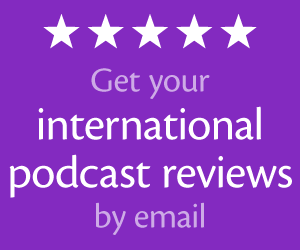 Learn more about our new inclusion in Stitcher. Another good episode, especially the part on auto ducking. Being a "global" listener, when mentioning copyright matters, it's best to qualify that your comments apply to copyright in the United States. Here in Canada, "fair use" is interpreted somewhat differently. Another useful resource for finding and using "podsafe" content is Creative Commons <a href="http://(http://creativecommons.org/)” target=”_blank”>(http://creativecommons.org/). It's my number one "go to" resource for finding material that even though copyrighted, with proper attribution the material can be used and even remixed in an episode or a presentation. Thanks, Bob! I did mean to mention that this was US-only laws, but it must've slipped my mind. I've heard Gordon interviewed in several podcasts, since he's now seen as the "social media lawyer." I'd like to interview him sometime, too. You’re welcome! I’m glad it worked well for you. I’ve found some good podcast music at danosongs.com – only requires an acknowledgement and a link back. Brilliantly helpful! Just learned how to do fadeouts. Now I need to know how I ‘stretch’ the file so that I can edit more accurately. Sounds like you want the Zoom tool. Press Cmd-+/- (OS X) or Ctrl-+/- (Windows), or hold Cmd or Ctrl down to zoom with your scroll wheel. 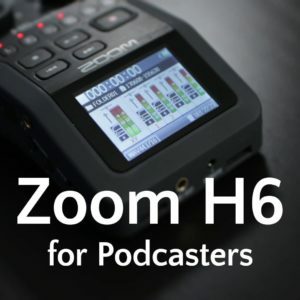 You can also highlight a portion of your audio and go to View > Zoom to Selection or click the magnifying glass with “–” under it. Thanks, Pete! But your covers of other songs would not be permissible for redistribution under Creative Commons because the original songs are still copyrighted. Thanks for not playing more of that song your friend did. The distortion was killing me. Wow! Thank You! I Constantly Wanted To Write On My Site Something Like That. taruhan bola kita Can I Implement A Fragment Of Your Post To My Website? Dan, thanks for the episode! Loved learning about the envelope function. I’m a newbie, just on my 9th episode in with Audacity, and I’m guilty of the terrible sound track volumes. You mentioned, in this episode that there was a UStream video of you going through these steps: where can I find that? You’re saying of fixing your volume levels? There is no such person who does not like music on earth. Songs cheer the mind, so the song should love everyone. Most of the songs are chosen by people who are healthy.I read the blog, I think this is a vary informative and helpful article.I appreciate for your blog. Check out those blogs in the future.